Special Offer: Buy 6x 175 Litre Grit bins + 1 tonne rock salt and receive a FREE TomTom sat nav. The 175 Litres Grit Bin is our most popular grit bin and is suitable for storing grit/salt on residential and commercial premises. 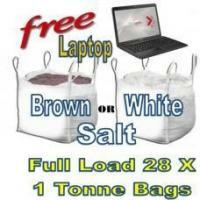 Constructed from durable and UV resistant polyethylene, the 175 Litres Grit Bin is an ideal grit storage solution. Our full range of Grit Salt Bins are designed with an angled lid to minimise the amount of snow and ice settling on the top of the bin, ensuring ease of use in winter weather. Also built into the design are channels for lifting either with a pallet truck or a forklift, which ensures the bins can still be easily positioned even when fully stocked with grit salt. Our 175 Litres Grit Salt Bins are inter-stackable up to 9 high and are an ideal option for storage throughout the summer months when not in use. 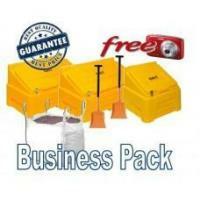 For great economy and savings on delivery, up to 18 grit bins will fit on one standard size pallet! 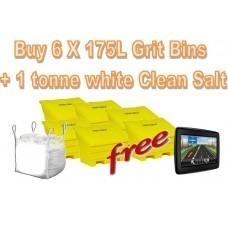 Keep the areas around your home or business ice free this winter by storing your grit/salt in our 175 Litres Grit Bins. External Dimensions: (Width) 885mm. (Height) 670mm. (Depth) 615mm. Our white rock salt is 100% pure and is cleaner to use than brown salt. 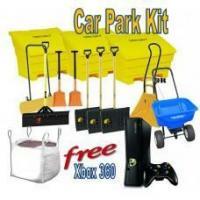 It does not require sweeping up and nor will drains need cleaning after use. The TomTom Start 20 Sat Nav is equipped with a larger 4.3 inch screen, for improved visibility when route-planning. As well as spoken street names and parking assist it has increased safety features including safety camera alerts and spoken instructions, allowing you fully focus on your driving. Pre-loaded maps for UK and Republic of Ireland. IQ routes to calculate your route based on the actual speeds measured on roads at different times of the day. Safety camera alerts - no subscription required. Free updates - 30 days latest map guaranteed. Saves past routes based on previous journeys. Lane guidance and advanced motorway exits display. Points of interest - displays locations such as petrol stations and restaurants. Up to 3 hours battery life. 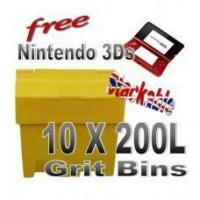 Grit Salt Bins is your one stop shop for all things Grit Bin related! 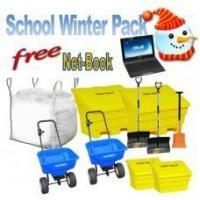 We stock a full range of Grit Bins, Salt Spreaders, Shovels and Rock Salt in the UK. 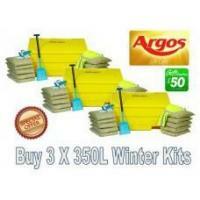 We always stock a full range of winter maintenance equipment at competitive prices and always aim to provide a high level of customer service. Our online shop contains detailed descriptions of our products and provides a secure online shopping experience.